An extinct language or dead language is a language that no longer has any speakers, especially if it has no living descendants. In the modern period, language death has typically resulted from the process of cultural assimilation leading to language shift, and the gradual abandonment of a native language in favour of a foreign lingua franca. A language that currently has living native speakers is called a modern language. As of the 2000s, a total of roughly 7,000 natively spoken languages existed worldwide. Most of these are minor languages in danger of extinction; one estimate published in 2004 expected that some 90% of the currently spoken languages would have become extinct by 2050. 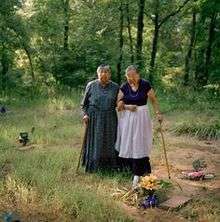 Sisters Maxine Wildcat Barnett (left) and Josephine Wildcat Bigler; two of the final surviving elderly speakers of Yuchi, visiting their grandmother’s grave in a cemetery behind Pickett Chapel in Sapulpa, Oklahoma. According to the sisters, their grandmother had insisted that Yuchi be their native language. Normally the transition from a spoken to an extinct language occurs when a language undergoes language death while being directly replaced by a different one. For example, some Native American languages were replaced by English, French, Portuguese, Spanish, or Dutch as a result of colonization. In contrast to an extinct language, which no longer has any speakers, or any written use, a historical language may remain in use as a literary or liturgical language long after it ceases to be spoken natively. Such languages are sometimes also referred to as "dead languages", but more typically as classical language. The most prominent Western example of such a language is Latin, but comparable cases are found throughout world history due to the universal tendency to retain the historical stage of a language as liturgical language. Historical languages with living descendants that have undergone significant language change may be considered "extinct", especially in cases where they did not leave a corpus of literature or liturgy that remained in widespread use, as is the case with e.g. Old English or Old High German (etc.) relative to their contemporary descendants, English and German (etc.). In their study of contact-induced language change, American linguists Sarah Grey Thomason and Terrence Kaufman (1991) stated that in situations of cultural pressure (where populations must speak a dominant language), three linguistic outcomes may occur: first - and most commonly - a subordinate population may shift abruptly to the dominant language, leaving the native language to a sudden linguistic death. Second, the more gradual process of language death may occur over several generations. The third and most rare outcome is for the pressured group to maintain as much of its native language as possible, while borrowing elements of the dominant language's grammar (replacing all, or portions of, the grammar of the original language). Institutions such as the education system, as well as (often global) forms of media such as the Internet, television, and print media play a significant role in the process of language loss. For example, immigrants may travel from one country to another, their children then attend school in the country, and the schools may teach them in the official language of the country rather than their native language. Language revival is the attempt to re-introduce a recently-extinct language in everyday use by a new generation of native speakers. The optimistic neologism "sleeping beauty languages" has been used to express such a hope. Hebrew is an example of a liturgical language that has successfully been revived for everyday use. 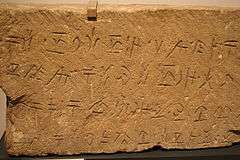 The revival of Hebrew has been largely successful due to extraordinarily favourable conditions, notably the creation of a nation state for which it was to become the official language. Revival attempts of minor languages with no status as liturgical language typically have more modest results. The Cornish language revival is an example of a major success for the revival of such a language, as after a century of effort there are 3,500 claimed native speakers, which has been sufficient to change the classification by UNESCO from "extinct" to "critically endangered". ↑ "Study by language researcher, David Graddol". MSNBC. 2004-02-26. Retrieved 2012-03-22. Ian on Friday, January 16, 2009 61 comments (2009-01-16). "Research by Southwest University for Nationalities College of Liberal Arts". Chinasmack.com. Retrieved 2012-03-22. CS1 maint: Multiple names: authors list (link). Ethnologue records 7,358 living languages known, "Ethnologue". Ethnologue. Archived from the original on October 5, 2001. Retrieved 2012-03-22. but on 2015-05-20, Ethnologue reported only 7,102 known living languages; and on 2015-02-23, Ethnologue already reported only 7,097 known living languages. 1 2 Malone, Elizabeth (July 28, 2008). "Language and Linguistics: Endangered Language". National Science Foundation. Retrieved October 23, 2009. ↑ Thomason, Sarah Grey & Kaufman, Terrence. Language Contact, Creolization, and Genetic Linguistics, University of California Press (1991) p. 100. ↑ Jack Knox. "Jack Knox — A silenced tongue: the last Nuchatlaht speaker dies". Times Colonist.